English Cottage Lifestyle, Issue #003 -- <> Harvesting and Drying Flowers. Drying flowers can be a great hobby and the cottage garden has plenty of flowers to chose from. For centuries the cottager has captured fragrance in the form of dried floral arrangements and pot-pourri to help sent the cottage. Dried flowers and herbs were also used in herb pillows and sweet bags. This article will focus on the more natural ways the cottager dried flowers and their uses. Pick flowers on a warm sunny day, not after rain, you need the flower to completely dry when you pick it to prevent mould. It is important to pick flowers like roses when the are not fully developed, the flower will open a little during the drying process and when it is dry it will look past its prime and some of the petals may fall off while drying. Remove your harvest of flowers out of sunlight as quickly as possible. Certain flowers will dry better at different stages of development for example Hydrangea’s should feel paper like to touch when harvesting for drying otherwise they will shrivel up. Make sure the flower is fully developed, or as developed as you want it to look when dry, before harvesting. The basic rule of thumb here is that the more ‘papery’ a flower feels the better it will dry. Pressing flowers between two heavy books lined with newspaper is the easiest way to dry several types of flowers. I dried flowers this way when I was a child I had had a dried flower collection each summer. I use books or a flower press for pressing. Flowers like violets and pansies are good examples of flowers that press well. Divide your harvest into small bunches and tie with a pure rubber band or use old pieces of tights or stockings as the stems will shrink when dry and the flower could fall to the floor and ruin the flower head. The bunches need to be hung upside down and left to dry in a warm airy room, wardrobe or garage. The drying place should be dark to prevent the flowers fading and with plenty of air circulating around the bunches to help drying and prevent mould forming. You will know when the flower is ready if you gently flex the flower head and it does not give. Most flowers take approximately two weeks to dry this way. For this method the flower needs to be harvested before the flower is fully open. Roses and peonies are good examples of types of flowers to dry with this method but they may shrink a little when air dried. Some flowers need to be dried upright in a vase with an inch or two of water. You let the water be soaked up by the flowers while they are in a warm, dark and dry place. Hydrangeas are an example of flowers that needs water drying. You can dry foliage simply by flat drying on a tea towel in a warm, dry and dark place for a few weeks. You will know when it is done as the leaf will turn golden brown. The best way to store dried flowers is wrapped in newspaper and placed in a cardboard box. Do not store in a damp place. You can store dried flowers in a colder place like the garage but too much dry heat from indoor heating can dry out your flowers. If stored out of the cottage place a few moth balls into the box to deter insects and rodents. To dust your dried flowers use a real feather duster or use a hair dryer set on the lowest setting. Keep out of sunlight to prevent fading. Your flower arrangement structure will dry further and ‘shatter’ if left by a dry heat vent. If well looked after your dried flowers can last for years. Comming Next Month...Making Pot Pourri and drying fruit. Fill a large, empty, fizzy pop bottle with water and while you are over the container plant, turn the bottle with the water upside down and stick the neck of the bottle into the soil. The water will be slowly be released over days. This trick I picked up in Panama; in the tropical heat the water in a two liter (0.43 gallons) soda bottle can last two weeks in a container plant! I will admit its not the prettiest solution but you can get creative and paint the bottles. So grab your diary and organise your gardening to do list with ECL’s August Calendar. 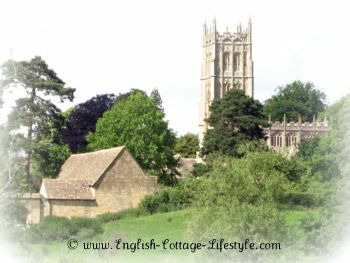 In July ECL covered the English cob cottage; their history and which counties you can see them. ECL will be covering cob building today at a later date. The timber frame cottage will be covered next. Here is the link to the English Cob Cottage. 1) Heat oven to 190c/fan 170c/gas 5. Butter 2 x 20cm sandwich tins and line each with a circle of baking parchment. In a large bowl, beat together all the cake ingredients until you have a smooth, soft mixture. Spoon the mixture equally into the two tins, smoothing over the top of each with the back of the spoon. Bake in the oven for 20 mins until golden and the cake springs back when gently pressed. Turn the cakes onto a cooling rack. 2) Heat the sugar, 2 tbsp water and Disaronno together until the sugar has dissolved. Leave to cool, about 10 mins. Use a large serrated knife to cut each cake in half. Brush the syrup all over all four pieces of cake with a pastry brush. 3) For the filling, whip the cream until it forms soft peaks. Beat the mascarpone and caster sugar in a large bowl to loosen, then fold in the cream and mix together until smooth. 4) Spoon a third of the cream mixture over one of the cake halves. Scatter over some of the fruit (you don't want to cover the cake), then sandwich another half on top. Spread with cream and fruit as before and top with another half of cake and more cream and berries. Lay the final cake half on top. Gently press down, then wrap tightly in cling film and leave in the fridge overnight. To stop the cream from melting, this cake needs to be transported to the picnic in a cooler box. At the picnic, carefully remove clingfilm and dust with icing sugar to decorate, if you like. Serves 6-8 Prep 45 mins. Cook 20 mins. Plus Overnight In The Fridge.